4/2 Tuesday, Elizabeth’s Dock at Deep Creek Lock, 1304.4, 48/39, cloudy with rain, NW10-20 - It was another cold morning. I actually slept in my clothes last evening because I couldn’t bear the thought of taking them off to change. We did our usual morning routine with the goal of being ready for the 8:30am opening of the drawbridge at South Mills. 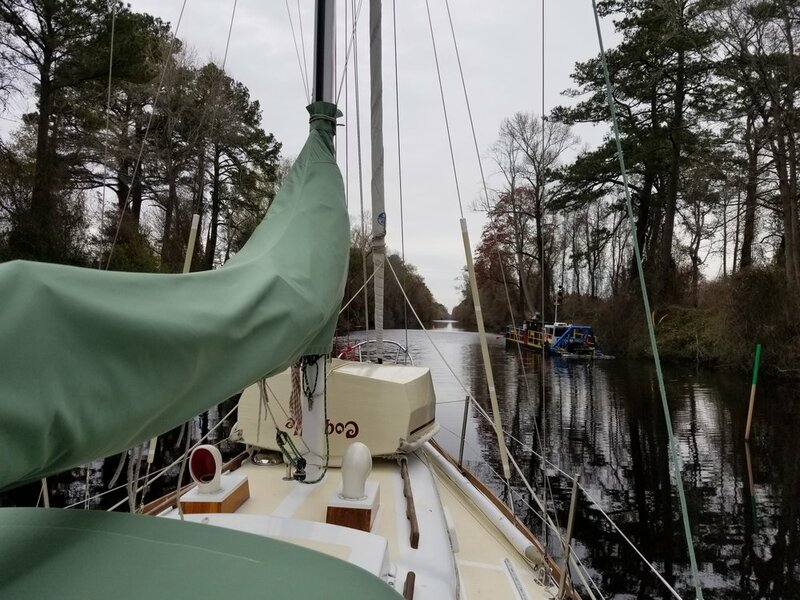 When it was time, we passed through and proceeded under motor for the length of the Dismal Swamp Canal, stopping at the bulkhead just before the Route 17 bridge in order to walk across the street to Food Lion for groceries. Passing the junction at the Feeder Ditch, where the dredge Elizabeth is currently stationed. Note the tree fallen across the canal up ahead. Dobbs had to carefully steer us close to the east bank in order to avoid its branches. In under an hour, we collected a week’s worth of provisions and made it back in time for the 1:30pm bridge opening. By then, rain was falling in a steady downpour and the wind was whipping down the canal. Dobbs maneuvered Grace over to Elizabeth’s Dock, where we’re spending the evening. There’s one other boat here - a sailboat that this evening has a generator running to compliment the occasional howl from its in-mast furler. It’s been raw all day. Since we arrived, I’ve been down below, doing Walden Rigging office work. Dobbs walked over to the lock tender’s house to hang out with Robert. It sounds like they had a good afternoon, first catching up and then, when it was time for the 3:30pm locking, Dobbs got to tag along and observe the controls for both the lock and the drawbridge. Since Dobbs’ return, we’ve been heating the Dutch oven on the stove and then enjoying its radiant heat. We had some cheese, crackers, and vegetables and played 500 rummy, though we stopped for dinner at 110 (me) to 375 (Dobbs). I made spaghetti with white beans and kale in red sauce, and garlic toast. We treated ourselves to a little carrot cake for dessert. It’s 8:25pm and I think Grace’s interior is the warmest it’s been all day. I can feel my extremities and they’re comfortable, unlike this morning when inside temperatures in the 40’s caused the dish soap to gel. After so many days of pushing ourselves, these last two of comparative ease feel too laid back. I’m determined to let the adrenaline settle and embrace the calm.